Here's the 1996 Millenium FalconHallmark Keepsake in detail. 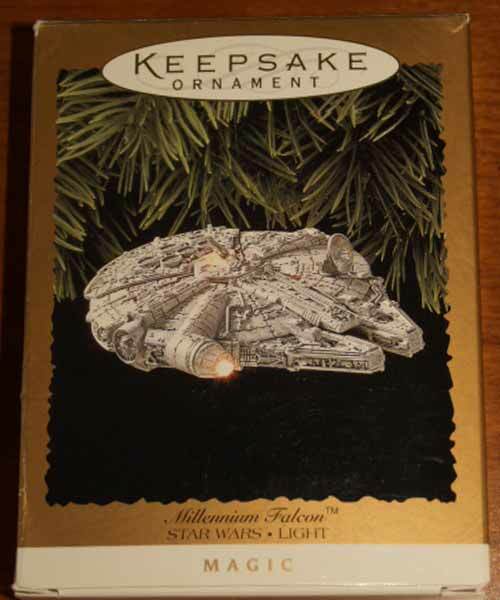 The Millenium Falcon was the first Star Wars ornament produced by Hallmark. 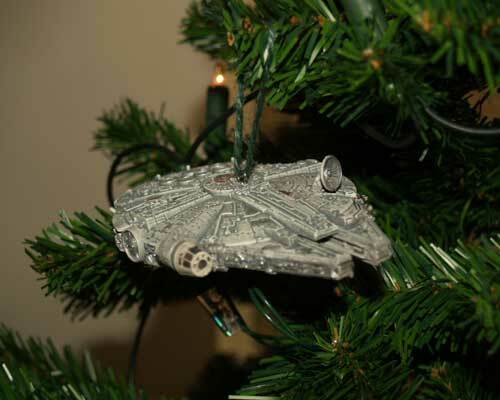 It has a plug you can plug into the tree lights (the common mini variant) and the Millenium Falcon will become lit. Lights will shine out of the cockpit, and you can see blue light emitted from the back. I'm sorry to say that the picture doesn't show the actual lights. I don't know why, it must've been a lighting problem with the camera. Looking for Star Wars Ornaments to hang in your own tree? Check the Star Wars Collectibles store.